I’ve been a bit quiet on this website for the last few months – my poetry and editing hat have rather taken over while my academic one has been gathering dust. This week, these things have turned around, partly because my tour has finished for the year, and partly because I’m off to the Paris archives tomorrow, to work on my monograph Staging Satire: Theatrical Metaphors in Prints of the French Revolution which is nearing completion. I’m very excited about this – my thesis has been hanging over me like a Damocles sword – and I’m glad that my gamble to take time off from regular paid work has worked out for the best where this is concerned! 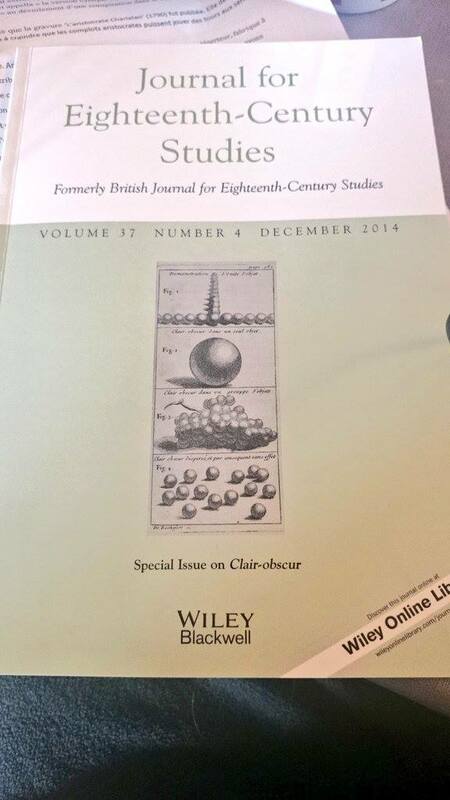 The other two bits of news that are bringing me back into the academic arena are that firstly my copy of the special issue of Journal for Eighteenth-Century Studies on the Clair-Obscur has landed on my doorstep, and that secondly I am frantically transforming a conference paper into an article for the Actes du Colloques: Théâtre et charlatans dans l’Europe moderne to be published by the Presses Universitaires de Rennes. I feel like a bit of a rogue academic sometimes, so this is a nice reminder that my research is of interest. Now, anyone fancy hiring me? By Clairet in PhD rebooted on November 19, 2014 .